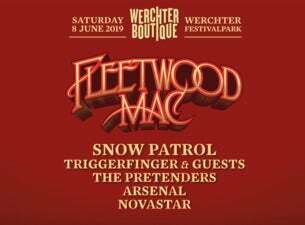 In 2019, US Rock Legends Fleetwood Mac will be the headliner of Werchter Boutique ! They will not only be joined by the always mesmerising Snow Patrol, but also by The Pretenders, Triggerfinger (and guests! ), Arsenal & Novastar. Is this a fantastic line-up, or is this a fantastic line-up?? Werchter Boutique is a festival for connoisseurs and partygoers. On the line-up: artists who can provide high-quality entertainment and can enthrall a large crowd in the open air. The party starts right after noon. There is dancing and singing 'till the night hits.